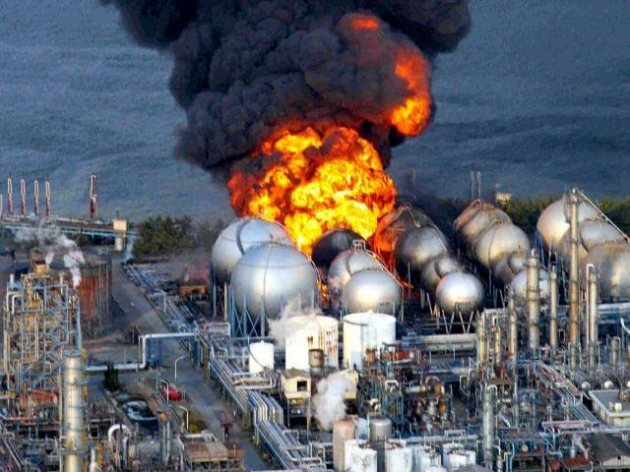 As we know, on March 11, 2011, an earthquake and tsunami affected the Fukushima Daiichi nuclear plant, causing the worst nucelar disaster since Chernobyl 25 years earlier. At first glance, the take home message from this is simple: nuclear power is dangerous, failsafes don’t work, and we should use less nuclear power and rely more on other forms of power. It is very hard to get accurate estimates for causalties that can be attributed to an event like this. Do we, for example, include the suicide of 102 year old man who refused to be evacuated? Still, best estimates are around 50 deaths immediately attributable to the nuclear plant disaster (not the earthquake and tsunami in general) and perhaps another 1000 more that will arise from cancers long-term. These deaths are not nothing, but they pale in comparison to the direct toll from the tsunami (15,000 – 20,000), or from other major recent natural disasters (Haiti 2010 earthquake: 90,000 to 300,000; 2004 Indian Ocean tsunami: 230,000; Sichuan 2008 eartquake: 70,000). Of course, we really should not compare casualties from a nuclear disaster to casualties from natural disasters – we can’t affect the latter by changing our energy supply. The question we need to ask ourselves is not, “Was the nuclear disaster horrible?” (Clearly it was.) Rather, we should ask ourselves, what does the disaster teach us about how horrible nuclear power in general is relative to the alternatives. This is the thing most people get wrong. Our brains are built to make strong emotional connections between a bad outcome and things associated with it. This is why many people have a general aversion to foods that gave them food poisoning, even if they know rationally that the risk is small. The same principle works to a lesser extent with things in the news – something bad happens, and we dislike the things associated with it. Unfortunately, the world is far from perfect, and we are often forced to choose the lesser of evils. A strong emotional reaction against something can hinder us from making a rational assessment of which evils are lesser. For example, almost every political administration has a series of scandals. Some of these are real, and some are manufactured by the opposition. (See my post on Fast and Furious.) This can result in a tendency to try to “throw the bastards out” at every election, though in fact some administrations have many fewer scandals (or of lesser magnitude) than others. Another example from politics is that elections usually revolve around the state of the economy (or, more precisely, recent economic trends), and politicans are held accountable. But a politican who comes in when conditions are bad may make things much better than they would have been otherwise – and still get blamed because things are not good. In terms of logic, the error we make so often is to ignore the counterfactual, or to fail to consider the plausible alternatives. We should not ask ourselves if X is bad, but rather if X is worse than what would have happened otherwise, or worse than Y and Z. Consideration of counterfactuals is not intuitive, but it is critical to arriving at the best conclusion abnout many things. I believe it is also something we can train ourselves to do, with proper effort. So let’s apply this logic to the Fukushima disaster and what it tells us about nucelar policy. Energy policy is a complicated subject which I can’t cover in detail in this post. Let’s simplify things a bit and assume that most alternative energy will not be economically feasible in the near future, so our alternatives are fossil fuels (oil, gas, coal, and other things than put lots of carbon dioxide in the air) or nucelar. The first thing we should observe is that the conditions surrounding the Fukushima disaster were about as bad as we might ever expect. It was the 5th largest earthquake recorded anywhere, ever. This resulted in a tsunami that was also particularly severe. Although Japan is earthquake prone, it happened in a specific place that was supposed to have fewer earthquakes. It happened to an older nuclear power plant that was overdue for maintenance and updates. In other words, it was a perfect storm of factors that came together. Had any one of these things been different, there would likely have been no nuclear disaster. Second, as horrible as the disaster was, it was not that bad compared to what we might imagine. Tokyo did not disappear in a mushroom cloud. In fact, radiation levels released were only about 10% of what they were after Chernobyl. Most importantly, global temperatures did not rise 3 degrees celsius, causing flooding, drought, and wars. While the details of how severe global warming will be are still hotly debated, many people believe that the conflict in Darfur may be due to increasing tension over land use. With increasing desertification which may be linked to global warming, farmers and herders that used to coexist peacefully are now fighting over rarer and rarer fertile lands. The death toll of the conflict may be around 300,000. True, we are not certain to what extent global warming caused this conflcit, but even if it caused only 1/300th of it, that still makes its contribution as bad as the entire death toll from Fukushima. And this is just one conflict based on one aspect of global warming. In other words, the take-home lesson from Fukushima is: even in the worst of the worst perfect storms in a developed country, the risk from nucelar power still does not seem nearly as bad as the risk from global warming. Yes, we should build nuclear power plants away from major population centers. Yes, we should update the technology and learn lessons from this disaster. And yes, we should be much more cautious about nuclear power in countries with unstable governments or a poor history of competent regulation. But we should also not miss the forest for a big, rotten tree: Fukushima is relatively strong evidence that nuclear power, under most situations, is the lesser of energy evils. What do you think? Let me know if you agree. I agree with almost everything here, so I’m probably not the most useful commenter. Power plants tend to be close to population centers because of power loss in transmission. After Fukushima I wouldn’t want to put a nuclear plant in a tsunami zone. Not sure about earthquake faults (apparently safety at Fukushima was compromised by the flooding, not by earthquake damage –but I don’t know if all plants are so robust). Nuclear power is also used for electricity, which is still hard to use for cars and planes. So the fossil-fuel tradeoff is mostly with coal or natural gas. A lot of the US uses coal, which is bad for your lungs as well as the climate. Likewise, I agree with your precisions – not much more to say. Air travel has gotten safer over time. One wrinkle is that some of the most important safety lessons were learned from crashes. We think of nuclear power as being riskier, but I think experience shows that it isn’t. We’re not really going to destroy a city with any reasonably designed plant. The risks are more comparable to plane crashes. There is an important difference between air safety and nuclear safety: for the former, hundreds (thousands?) of crashes and failrues have provided data on what can go wrong under different circumstances. This is essential because even the most creative engineers are not capable of foreseeing all possible problems an confluences of risk factors that are likely to occur. Over time, the safety of air travel has increased markedly with the introduction of double- and triple- back-up systems for almost every component or factor that could fail. There are so few nuclear disasters that it will be very hard to assemble this type of data and create equally robust systems. This is partly because there are many more planes in use all the time than nuclear reactors, and partly because (I guess) the mechanics of flight are much more complicated and have many more weak points than a nuclear reactor. On the flip side, the fact that there are so few nuclear disasters means that we have less need of perfectly robust systems. Over the course of history, mortality from plane crashes must far exceed mortality from nuclear accidents (I’m excluding Hiroshima and Nagasaki), and this seems unlikely to change. Another way to look at it is, what is the value of air travel to us relative to the value of nuclear power (as opposed to fossil fuels). If nuclear could prevent global warming, perhaps the societal value would be as great as that of air travel, and at less cost in human life… Of course, that’s subjective. And I think Fukushima demonstrates the fundamental vulnerability to flooding. I don’t think we should build nuclear plants in places that get tsunamis. Maybe that’s too stark: maybe an artificial 500-foot hill would be enough. But I trust that kind of big-picture rule more than I trust very technical rules that depend on lots of people doing their jobs well. Back to counterfactuals, I don’t know how much blood and treasure would be saved by having widespread nuclear. Just reducing emissions from coal plants seems like a lot though. And I think it could be far more important than that, if it could reduce the revenues of fossil-fuel kingdoms. Hi, my name is Choe and it’s so nice to read your post. Pardon me but may I ask where’s the source of the photo on the top of this post? I’m an editor from Korea and it’ll be very great if I can use that photo on the book that we’re going to publish, after asking to whom has the copyright. If you have a information or something, please help. Thank you very very much. Unfortunately, I don’t remember where I got the photo, other than that it was through a web search and that I didn’t see any specific copyright information suggesting that I shouldn’t use it. I’m kind of surprised that my post (rather than the original photo) now comes up so high on a Google image search. For an editor of an official publication (not just an informal blog like mine) I would recommend using a photo where you can better document its history. Are you sure that’s Fukushima? Looks like a chemical plant.